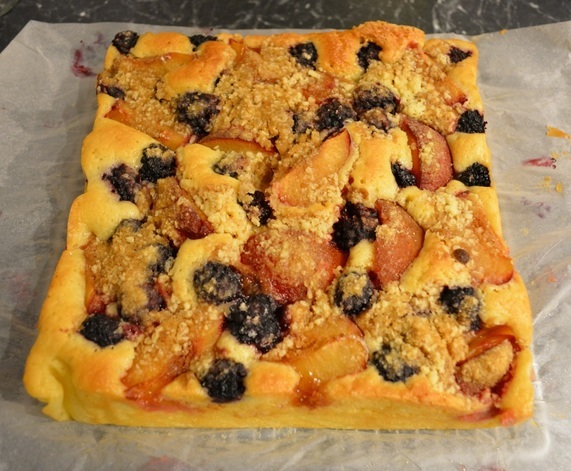 Of all the cakes I ever make for my family, a simple cake like this, with fresh fruit in it, is always my families favourite. When a cake like this is made in my house, it goes so quickly, they just love it. As for leftovers (when there is leftover), my kids and husband will try to claim any leftovers, it always makes me laugh. This is a great cake to have in summer after a light dinner and you just feel like something flavoursome, fresh and sweet. My youngest absolutely loves blackberries and plums, so when I saw this recipe I knew I had to make this for him. And being summertime, the blackberries and plums didn't cost too much either. If you don't have a food processor to make the topping, just rub the butter into the flour, by hand. So if you love fresh fruit in your cakes, give this one a try, it is delicious. Preheat the oven to 170C/150C fan forced. Grease and line with baking paper a 22cm square cake tin and line with baking paper. Make sure the baking paper extends up to the rim on two sides to assist you with removing the cake from the tin once cooked. Make the topping: Place 50g of the flour in a small food processor. Add the cold cubed butter. Blitz until it resembles coarse breadcrumbs. Stir in the brown sugar and set aside. For the cake: Sift the remaining 250g flour, the baking powder and a pinch of salt into a bowl. Set aside. Place the softened unsalted butter and caster sugar into a large bowl. Beat with electric beaters until nice and creamy. Add the eggs, one at a time, beating well after each addition. Add half of the flour mixture and half of the sour cream, beat on slow until nearly combined. Add the remaining flour mixture and the remaining sour cream, and again beat until just combined, be careful to not overbeat it. Pour the batter into your prepared cake tin. 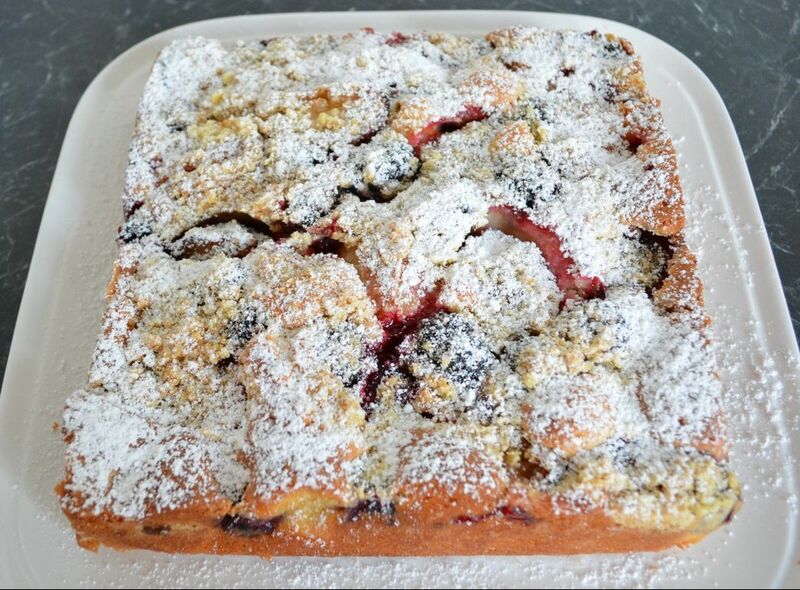 Scatter over the plums and 150g of the blackberries. Bake for 55-60 minutes, or until a skewer inserted into the centre comes out clean. It can take a little longer depending on your oven. Allow the cake to cool for 10 minutes in the tin before lifting it carefully out of the tin. 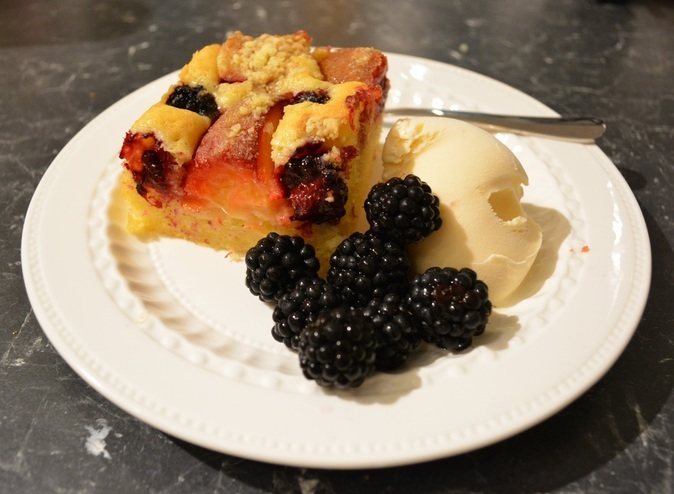 Serve warm or at room temperature on it's own dusted with a little icing sugar or serve with the remaining blackberries and vanilla ice cream.